Did you know that Old Bergen Church provided donations, monetary support, and a Christmas tree to Church World Service over the holidays? The children of the Sunday School made ornaments at the Advent workshop and Pastor Jon picked up a small white Christmas tree and lights to brighten up the offices of CWS at Journal Square. 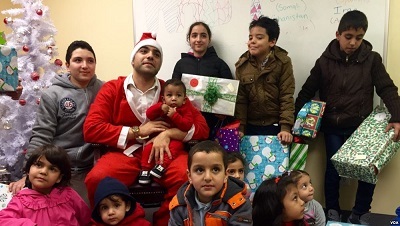 The staff of CWS wrote: On December 23rd we hosted our first annual CWS Jersey City Holiday Party. Our families joined us in our office for some holiday cheer including a visit from Santa Claus. Presents ranging from LEGOs to Play-Doh to warm winter gear, generously donated, were individually wrapped for each child. Santa called the names of each youngster who came forward to get two gifts each. All of the kids then opened their surprises together, running excitedly to their parents to show what they received.